For over 20 years David Maisel has focused his cameras on specific US terrains as seen from low-flying planes, creating startling images of disturbing yet beautiful environments. After concentrating on copper and coal mines in the 1980s, he documented the nearly-drained Owens Lake, which is located on the eastern side of the Sierra Nevada Mountains in Southern California. He also shifted from black-and-white to color images and considerably increased the size of his prints while conceptually pushing the tension between abstraction and recognizable realities. 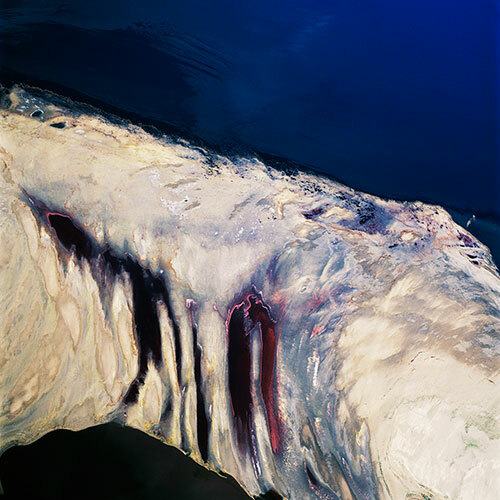 His most recent works feature another shift in subject —- to the Great Salt Lake, and in the levels of abstraction as well as the disturbingly engaging duality between beauty and repulsion. How do we, the audience, respond to photographs that are not narrative? What do we think when the picture’s details are clearly delineated, but the whole is undecipherable, or when right-angles identify a man-made structure but no conceivable function comes to mind? In his project Terminal Mirage, Maisel intentionally obscures the function, location, scale, and condition of his subject. No title names the Great Salt Lake or its environs as his subject. His images all share exquisite abstract colorations and design. A few pictures are obviously landscapes. Others are so lacking in items that identify scale they might be images of deteriorating walls or macro photographs of laboratory dishes. As he intends, we are first engaged by the beauty that dances across these large scale prints. Then myriad questions arise from curiosity. Who or what created what we see in these views? The answers are neither easily explained nor universally confirmed, and the answers are less interesting to Maisel than the questions and discussions the pictures might evoke. The Great Salt Lake in northwestern Utah has been the site of a lake for millions of years. At times, it is the fourth largest terminal lake in the world, with its status changing with the rise and fall of its depth and square acreage. Between 1850 and the present, the lake’s level fluctuated over a range of more than 20 feet, resulting in a surface area shift from 970 to 2,280 square miles. The greatest heights were achieved in the 1860s and the late 1980s. Its lowest level was in the early 1960s, and it is again in a downward shift, which is partly due to man-made solutions devised to control the flooding of the eighties and partly from natural events such as a decrease in rainfall. The lake’s most distinctive aspect is, of course, its exceptional richness in five major elements (sodium, magnesium, potassium, chloride, and sulfate) as well as other elements in lesser quantities. The naturally occurring minerals in the soil, leach into the water and are concentrated in varying strengths in the lake. The salinity of the lake rises and falls inversely with the level of the lake from 5% to more than 25%. In recent years, the levels in the northern half are considerably greater than its southern reaches because a combination of rivers empty into the south, but that fresh water can no longer reach the northern sections since Southern Pacific Railroad built a causeway that bisects the lake. As each mineral element has its own color, the density of the colors of the lake relate in part to the levels of concentrations present at any given time of specific elements. For instance, the lavender is possibly a concentration of molybdenum. Other sources of color are the numerous species of algae and bacteria. The greens are most commonly phytoplankton called Dunaliella viridis, a salt-loving, green pigmented variety of algae. Some of the reds, particularly those around Robert Smithson’s Spiral Jetty are salt tolerant bacteria. Also seen in Maisel’s images are the evaporation tanks on three sides of the lake that are commercially operated to extract salts and minerals for industrial use as well as the igloos that store aging chemical weapons at the Tooele Army Depot (a high-priority superfund site), and the dioxin-laden grounds and wastewater ponds of the Magnesium Corporation of America, the site of a recent EPA lawsuit. We cannot know without expert explanation which of these colors arises from naturally occurring elements or organic matter and which are deadly toxins created from man-made processes. Nor can we tell which of the naturally occurring concentrations would be toxic if ingested. We sense that this violent range of continuous colors is extra-ordinary and possibly dangerous. Nevertheless we are drawn by the formal beauty. These pictures are both visually and intellectually engaging, both seductive and disturbing. While Maisel abhors mankind’s mismanagement of the environment, his driving interests are aesthetic and philosophical. A serious student of the ideas as well as the art works of Robert Smithson, Maisel, like Smithson, questions the process of perception and knowledge. His attraction to the Great Salt Lake is due in part to the presence of Smithson’s Spiral Jetty, which was created in 1970 and is currently visible again after years of being submerged. Maisel is drawn to earth sites that have undergone intense transformations from natural and/or unnatural causes where those transformations take vivid visual form when viewed from the air. Any understanding of the pictures is predetermined by the nature of the questions asked and in part, by what Maisel has selected to present. The emotions evoked and any conclusions that we draw are determined by what we observe, our experiences and levels of expertise, the quality of our curiosity, and our commitment to this particular pursuit of knowledge. In his pictures, Maisel achieves an appealing visual coherence that dissolves as we analyze what we see – a process that depends completely on the viewer. For Maisel, his images of the Great Salt Lake are catalysts with which he hopes to induce a complex range of emotions, perceptions, and possibly, new awarenesses.